Ingredients: Proprietary Blend Colossal Whey (Whey Protein Isolate Colostrum GliSODin) Organic Cane Juice Natural Flavors Guar Gum Stevia Leaf Extract Proprietary Energy Blend (Suma Root Extract Maca Root Extract L-Arginine Base) GanedenBC30 (Bacilius Coagulans) Salt Protease Betaine HCl. For optimum results mix 1 scoop (30.3 g) in 8-10 fl ox of cold water. 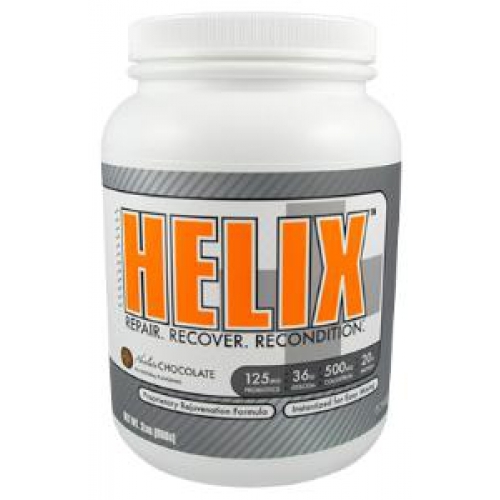 Great tasting Helix is instantized for easy mixing with no clumping. 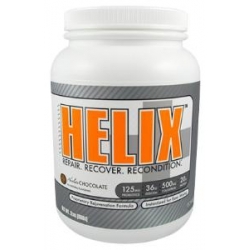 Drink Helix 1/2 hour before and/or after physical activiy. During times of high stress or intense workouts increase serving size.